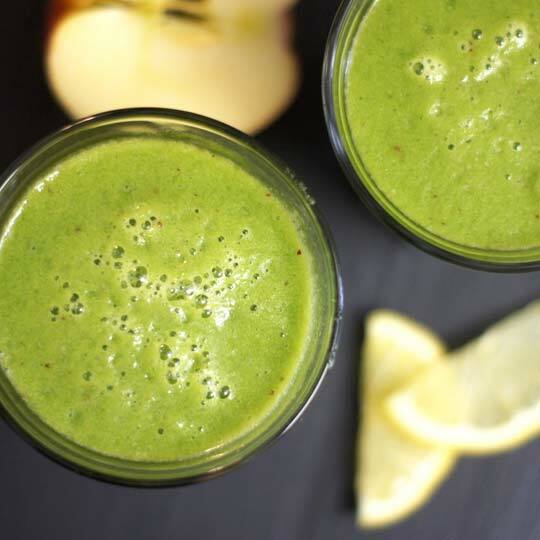 Meet one of my favorite green smoothies. It features all of the ingredients that I love in my usual green juice, but because it’s blended, it still retains all of the fiber of the fruits and vegetables, making it a more filling breakfast option. I’m often asked what the difference is between green juices and green smoothies, and which is the better option. The answer is that they’re both beneficial, but for different reasons. A juicer removes the fiber from the fruits and vegetables, leaving us with a nutrient dense green drink that can be immediately absorbed by our cells, without involving the digestive system. Juicing is a great option for people who need to rest their digestive system, or for those who want to participate in intermittent fasting, while still getting a healthy dose of nutrition. A blender, on the other hand, pulverizes the fruits and vegetables, including the fiber content, resulting in a thicker, more filling drink. Smoothies are ideal for anyone who wants to sneak in a few extra servings of fresh produce into their day, and can be beneficial for those with compromised digestion. There are some who believe the natural sugars found in fruits and vegetables are better consumed with their fiber in tact, for balanced blood sugar levels, making green smoothies a popular option. Smoothies also require less produce than juices, making them more budget-friendly. Personally, I love both options, but my preferences usually change with the seasons. When it’s chilly outside, I typically want a more filling meal, so a thick smoothie fits the bill. When it’s warmer outside, I’ll enjoy a green juice as a light breakfast, and later, I may have a hearty smoothie as a more filling lunch or post-workout snack. Whichever your preference, this smoothie is a delicious and refreshing option! Add more water, if needed to facilitate blending, then serve immediately. *Note: If you do not have access to a high-powered blender, I recommend blending the leafy greens and water first, until they are completely broken down, before adding the fruit and ice to the mix. Also, you may prefer using spinach, rather kale, as it will dissolve into the smoothie more seamlessly. This green smoothie features all of the ingredients that I love in my usual green juice, but because it's blended, it still retains all of the fiber of the fruits and vegetables, making it a more filling breakfast option. If you do not have access to a high-powered blender, I recommend blending the leafy greens and water first, until they are completely broken down, before adding the fruit and ice to the mix. 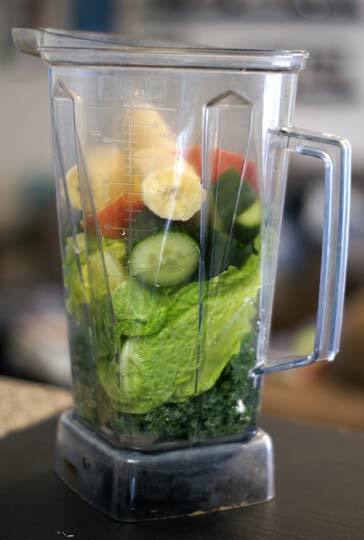 Also, you may prefer using spinach, rather kale, as it will dissolve into the smoothie more seamlessly. Reader Feedback: Do you prefer green juice or smoothies? What’s your favorite flavor combination? What is a 1/2 romaine heart? Hi Megan! This looks amazing but I have an issue, I am allergic to bananas and I am lactose intolerant. I know that bananas are usually used to replace yogurt or milk but is there something else that I could use in replace of the banana? Any other fruit should work in this particular smoothie, and avocado can add creaminess, too! I LOVE this shake. My family love making juice but I don’t have room for a juicer in my little student flat so I was very happy to come by your healthy shake recipes that I can use my little smoothie blender to make. I like to put some fresh ginger in with the original recipe, or sometimes I use lime instead of lemon and throw loads of mint in with that – mojito style! I tend to use spinach because kale generally isn’t available in the shops near me but I feel like it works just as well. I like to have this shake as a mid-afternoon pick me up (when I start getting major sugar or nap cravings)so when I want an extra kick I also add matcha (a green tea powder) which tastes pretty terrible by itself but isn’t detectable in this lovely concoction. Wow! This looks AMAZING. I love sipping on lemonade and this looks like a less sugared-up version that I can’t wait to give a try. Have never been one for having a smoothie for breakfast, but I decided to try the Blended Green Lemonade and I’m glad I did. I have now ditched the bowl of cereal and only have smoothie’s for breakfast. Is there a reason why one should not use the stems from the kale? I use kale in all my smoothies. I separate the leaves and stems, freeze the leaves to use as needed. I save the washed stems, freeze and use them in the smoothies also. do they have the same nutritional value? I have not tasted a difference. Tried it because I hate to waste any produce if possible. Thanks for this recipe. Sounds yummy! ** I followed your reader’s suggestion above and juiced everything but the avocado and frozen banana; then I threw it in the blendtec and blended it with the avocado and banana and a little ice. Delicious! It felt thicker and more satisfying than just drinking juice (in my opinion), but I tolerated it much better because the fiber had been removed – and I still got the benefits of the greens! Yay. And yum! Thanks again. I add a piece of raw ginger root too. Adds a bit of spice and is so yummy and good for you too! Hey there! This is AMAZING… Thanks for the recipe! I’d like to share it on my blog in an upcoming post where I talk about some of my favorite recipes that I’m using during my current cleanse… May I link to this recipe and use your photo if I attribute it to YOU? Please let me know! Thanks! I’m a smoothie fan myself! I usually have a green drink for breakfast and the smoothie’s thickness helps keep me fuller longer. Thanks for all the info in re: smoothies versus juicing..
Just made this tonight and loved it! A+ all the way. Didnt have Romaine so used Baby Spinach Leaf and omitted the Avacado. Also, just added the whole peeled lemon (de-seeded and peeled) and it rocked! This looks like a great alternative to my usual smoothie lineup! I love smoothies because of their convenience and tend to leave juicing to more leisurely times such as the weekend. Thanks! This looks delicious! Just curious…what does it taste like? 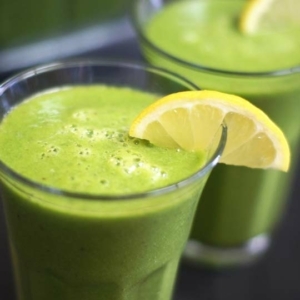 You mostly taste the fruit and the lemon, which is why this drink is called “green lemonade.” There is a slight green taste, but the lemon and sweetness really helps hide all those leafy greens! i love juicing cilantro, lime, granny smith & a bunch of greens for a really unique limeade drink 🙂 i like juice on winter mornings and smoothies on summer ones. That sounds like a fabulous combo ~ I was experimenting with cilantro in my smoothies last week and really loved the vibe! i finally understand why leafy greens can be mixed with fruit (as they are not ‘vegetables’, but in fact leaves) However, how does cucumber fit into the equation? it is a vegetable…and according to all food combining “rules”, it shouldn’t be mixed with fruit? then again…all of our bodies are different and somethnig that uspets one person’s stomach is fine on another person’s stomach! Actually, a cucumber is technically a fruit, too! It’s just more commonly referred to as a vegetable, like tomatoes, because it’s not as sweet.